Other gardeners are doing what I do–bringing flowers into the house. In July, we have a couple months of flowers yet to enjoy, and we take the abundance for granted. But in September, any day could be the last for the garden. Morning comes later, evening darkness sooner. 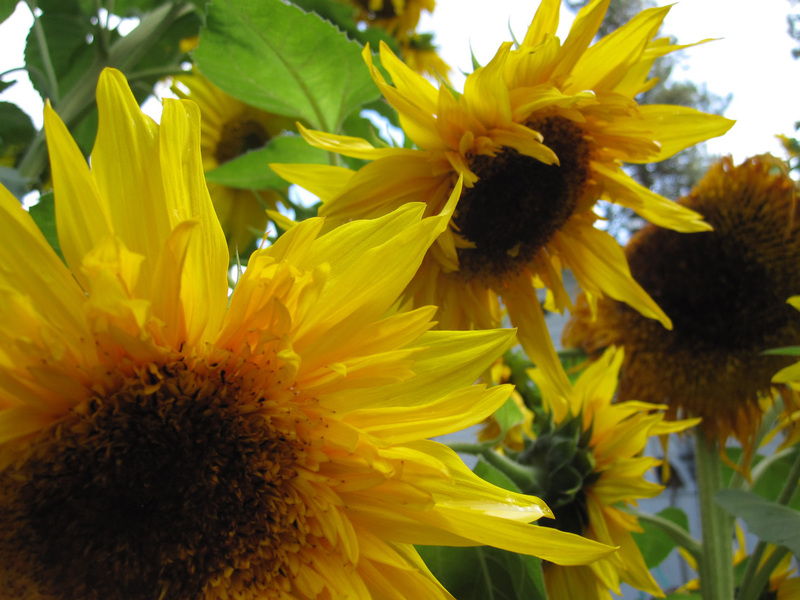 To wake up and find sunflowers out my window–still! in spite of rain–feels like a celebration of yellow. I brought in white phlox, deep pink rubrum lilies spotted with freckles and pollen, purple native asters. A faint fragrance wafts through the house. I cut big puffs of gold-toned dahlias to pile in a glass vase. Artists from many cultures and centuries have turned their eyes and hands to flowers. I feel that pull too. How to draw and paint them without giving in to the merely pretty? How to show how incredible and transient they are? I have books on botanical illustration. The value in this approach is the close observation and wonderment in detail. I have books showing Japanese prints of flowers. These are closely observed, yet have poetical meaning. A chrysanthemum is a beautiful thing and it signifies autumn. Autumn signifies change and yearning. My art history books show European Baroque paintings of flowers. To me, these demonstrate the pleasures of paint and the mastery of craft, a sort of showing off. Yet flowers in a vase can also be a memento mori, a reminder of mortality. When we cut flowers and bring them inside, they die before going to seed. This could happen to anyone, so be mindful and humble. Why grow flowers? I don’t eat them. I grow flowers for my own gratification, I guess. The neighbors say they enjoy them too. It’s not a practical act to put seeds in the ground to just watch plants grow then go dormant or die. I like the colors and shapes. I like the bees and butterflies. I like giving them away. I like when the snow melts and the first green shoots appear, a banner of flowers unfurling until the snow flies again. So while I still have them, I will pick glowing jewel-toned nasturtiums for my kitchen windowsill.